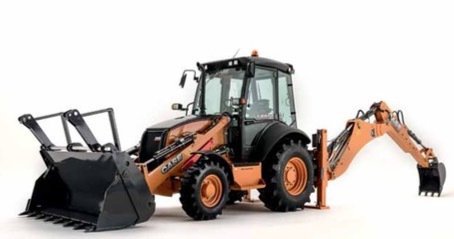 CASE Construction Equipment is extending its backhoe loader offering with the introduction of a new backhoe design with in-line cylinder geometry and inner ‘extendahoe’ on its 580ST model. Now customers can choose the design that matches their specific needs best: the new in-line geometry or the well-known CASE boom with overlapping cylinders and outer extendahoe. And they make their choice in the knowledge that, whatever they choose, they can count on the premium digging and lifting performance CASE backhoe loaders are known for. On the other hand, the well-known CASE design with overlapping cylinders has a shorter boom, lower transport height and protected outer sliding extendahoe. The new in-line geometry, which maintains the S-shape boom that is part of the CASE backhoe DNA, ensures that the effort is evenly distributed over the entire length of the boom, resulting in high stress resistance. In addition, the narrower frame of the boom provides better visibility of the working area at the back of the machine. Operators looking for exceptional breakout force and great reach will find their ideal solution in the new in-line boom. With 5,520daN and 4,100daN respectively, the 580ST featuring the in-line boom design delivers great breakout force both at the bucket and at the dipperstick — and it reaches as far as 6,647mm from the swing centre. The CASE DNA boom geometry with outer extendahoe is the perfect solution for tough working conditions, as the sliding part never touches the soil, while the components that do are protected against impact and material accumulation. The design with overlapping cylinders reduces the CASE 580ST’s overall boom transport height to just 3.5m, making it easy to transport the machine with no waste of time and fuel. More time is saved with the patented integrated hydraulic quick coupler, which allows the operator to change backhoe attachments from the cab with the simple flick of a switch. The 580ST model carries the CASE backhoe loader DNA, built on the company’s long history of industry firsts. Since it launched the world’s first factory-built tractor loader backhoe in 1957, the brand has produced more than 600,000 units and CASE backhoe loaders have become synonymous with performance, high lifting capacity, best digging depth, and great breakout forces. Now they are benefiting from technologies developed within CNH Industrial to extend the offering by giving customers the choice of boom geometry to match their specific requirements. CASE Construction Equipment sells and supports a full line of construction equipment around the world, including loader/backhoes, excavators, motor graders, wheel loaders, vibratory compaction rollers, crawler dozers, skid steers, compact track loaders and rough-terrain forklifts. Through CASE dealers, customers have access to a true professional partner with world-class equipment and aftermarket support, extensive warranties and flexible financing. CASE Construction Equipment is a brand of CNH Industrial N.V., listed on the New York Stock Exchange and on the Mercato Telematico Azionario of the Borsa Italiana.